.. so what is a TRIMTAB anyway? 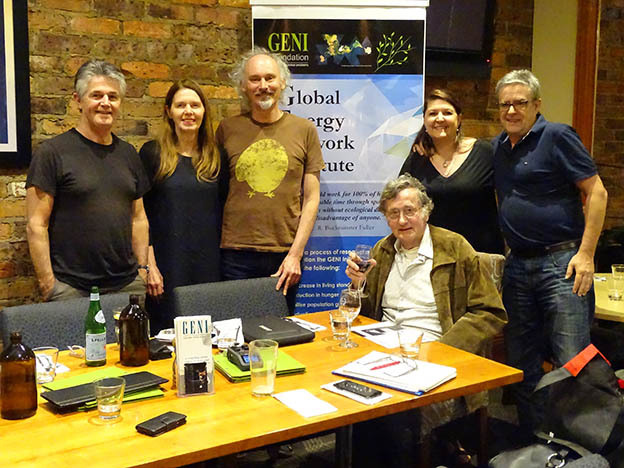 "The GENI Foundation initiative involves building awareness and powerful support, in the shortest possible time, for the integration of electrical energy grids around the world into a single interconnected grid that spans the globe*, generating and distributing power from the Earth's naturally abundant renewable resources - an initiative that will improve the quality of life for everyone without damage to the planet." *Walter Cronkite uses the analogy of "a world wide web of electricity using green energy resources." Come and join us on the first Thursday of every month from 6:30PM to 8:00PM. Exploring practical solutions to global and local problems, to build a world that works for everybody - not just a minority! Using Lithium Titanate (LTO) cells, Zenaji’s Aeon Battery is a leap forward in battery storage. Zenaji Aeon batteries offer the most robust, safest, longest life and most cost effective solution available in the world today. The Aeon Battery is designed for use in domestic and commercial solar and stand-alone energy storage installations. We have developed manufacturing processes and a Battery Management System (BMS) which optimizes the Lithium Titanate (LTO) cells, simplifies the battery design and reduces the circuitry required for effective cell management. With a 20,000 cycle life and high maximum continuous charge rate Zenaji Aeon Batteries take full advantage of solar & wind energy. The average home has peak usage in the morning and evening. By cycling twice per day the Aeon Battery allows use of all available solar energy to provide stable power supply throughout the entire day. No other battery on the market has the cycling ability, performance, life span and high safety of Zenaji Aen Batteries, making them a sound economic investment. Use our promotions code 'GENI-Zenaji' and you can purchase this new Battery Technology from Zenaji Australia at the price of AUD$3299 +GST (per 2kw module). With Government rebates of up to $2,225* available, Victorians can now combine solar with one of the most modern battery technology on the market today. *Eligibility criteria apply. Visit the Solar Victoria Solar Homes Program to review your eligibility and to learn more about registering an application, please visit Solar Victoria to Apply for a rebate. Pledge your support for this initiative using our fund raising platform 'PATREON'. 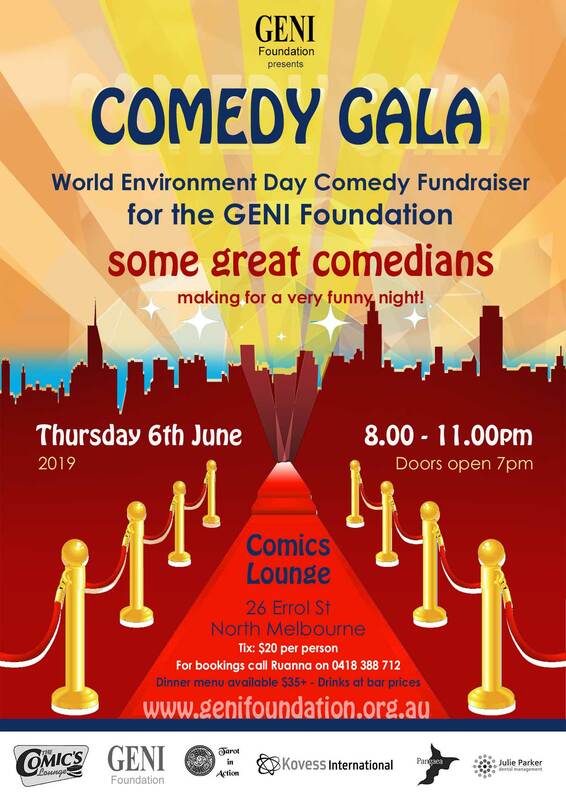 Thank you to all our friends and supporters for another wonderful and fun Annual Fundraiser at the Comics Lounge for June 2018! 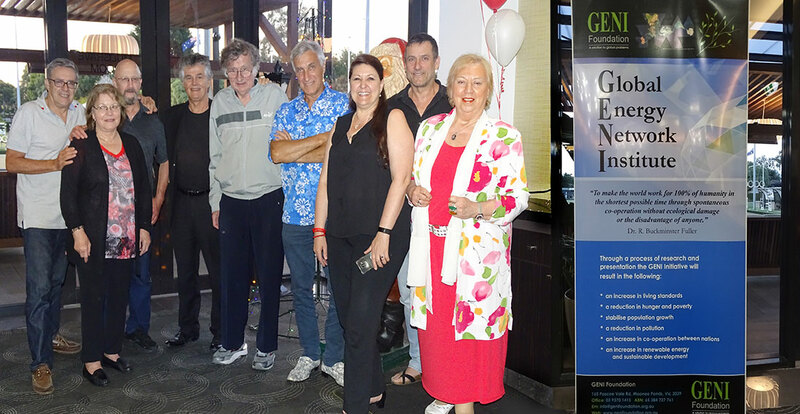 A CORPORATE SOCIAL RESPONSIBILITY PROJECT DESIGNED BY CHARLES KOVESS, A GENI FOUNDATION TRUSTEE, AND SUPPORTED BY GENI FOUNDATION. THE INSTALLATION OF 10,000 SOLAR ENERGY GENERATORS IN 10,000 OUTBACK AUSTRALIAN, AFRICAN AND INDIAN VILLAGES - ONE CORPORATE SPONSORING ONE VILLAGE AT A TIME! 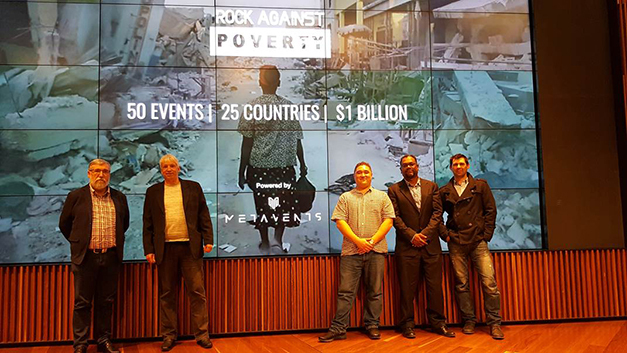 Rock against PovertyTM (RaP) as an underpinning creative fundraising mechanism to channel much needed financial resources for the cause of fighting poverty alleviation and climate change; its target is $100 million pa. RaP aims to free poverty alleviation and climate mitigation from donor and international lenders&apos; dependency. 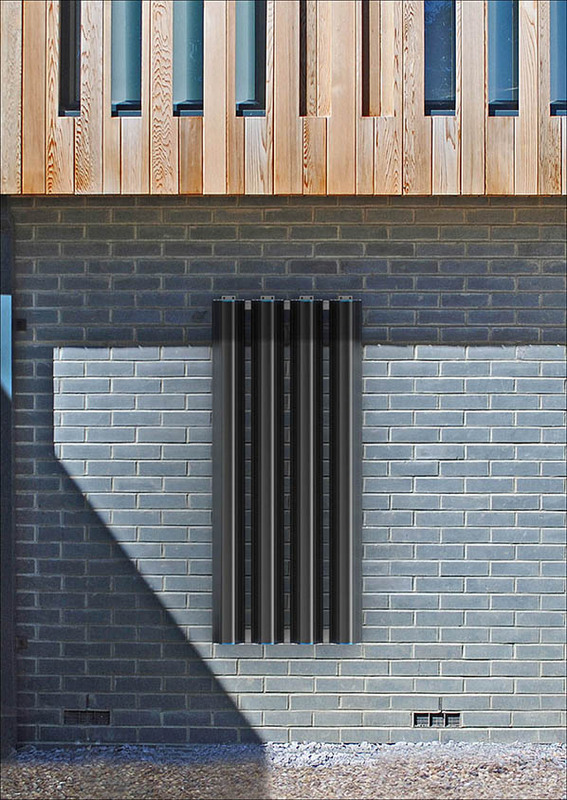 Having a solar system installed on your house is like having a net that will catch fish every day, rather than being given a fish occasionally. Imagine how you would feel if someone came along and said they will installs solar panels on your roof. How would you feel? Does it feel like your organisation is moving 1 step forward, but 2 steps back? We are a leading edge Australian consulting organisation, focused exclusively on providing integrally based scaleable solutions to modern leadership and organisational development challenges. We work with leaders and key decision makers who want to create real systemic and sustainable transformation for their organisations, their people and themselves. 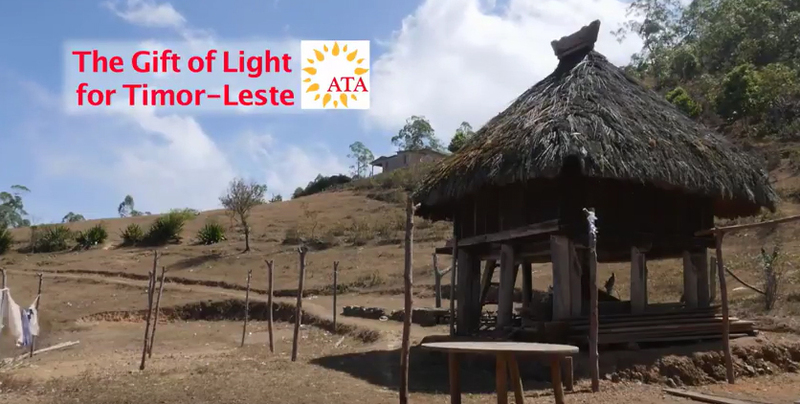 The Light Up Laen Tolu project addressed energy poverty for 38 households (approximately 230 people) in Suai, an under-developed fishing village in the sub-district of Covalima in Timor Leste. 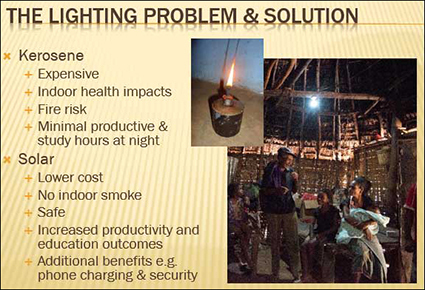 Through the Village Lighting Scheme (VLS), our project provided solar-powered lighting and mobile phone charging to 39 houses with no access to electricity. Two local technicians were trained to install and repair the solar systems. Our project provided environmental, health, educational and economic benefits to the people of Laen Tolu. The project employs a rigorous monitoring system, established an ongoing community managed maintenance fund and utilised a shared online database for tracking. This project can be scaled up and replicated in other districts of the country. 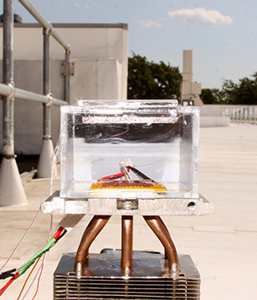 How to Pull Water Out of Thin Air, Even in the Driest Parts of the Globe. 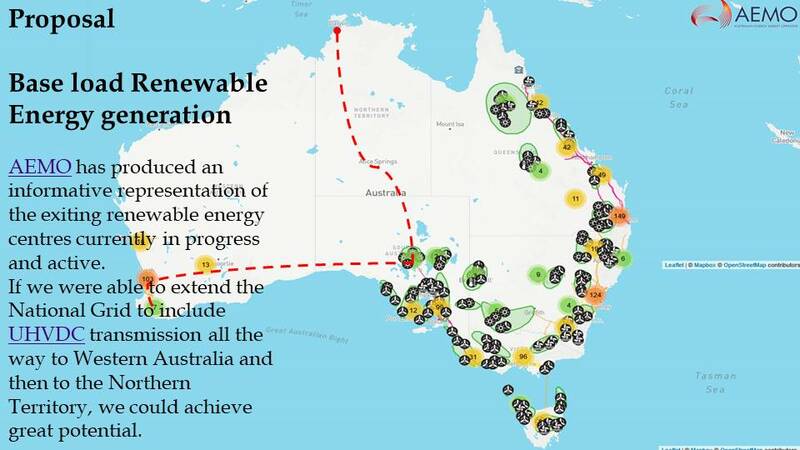 250 million people to a potential renewable energy supply. By canvassing industry leaders and educating the general public to the potential of this project. 2. Playing the Global Integration Game (GIG). 120 people have the opportunity to play a fun and interactive game on how the world works on a huge Dymaxion Map. 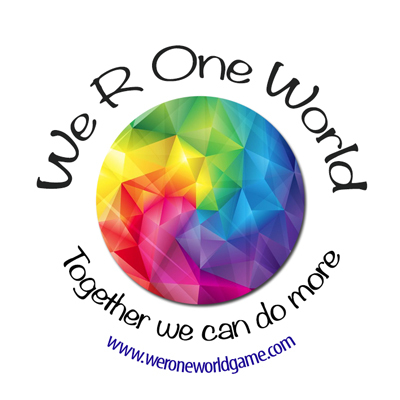 This game brings up insights in what is being done in the current world, what needs to be done, and what one can do about it. This game can also be played in Schools. 3. Presenting GENI Initiative in schools the 'Spaceship Earth School Presentation'. 90 minute interactive workshop presenting highlights between the Mercator Projection Map and Buckminster Fuller's more accurate Dymaxion Map. 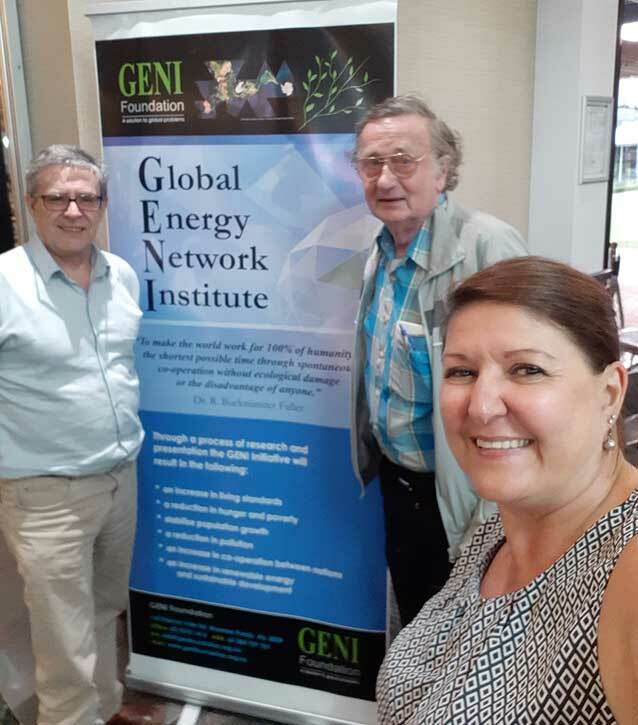 GENI is currently in discussion with organisations interested in developing our project to deploy IREC's (Independent Renewable Energy Centres). 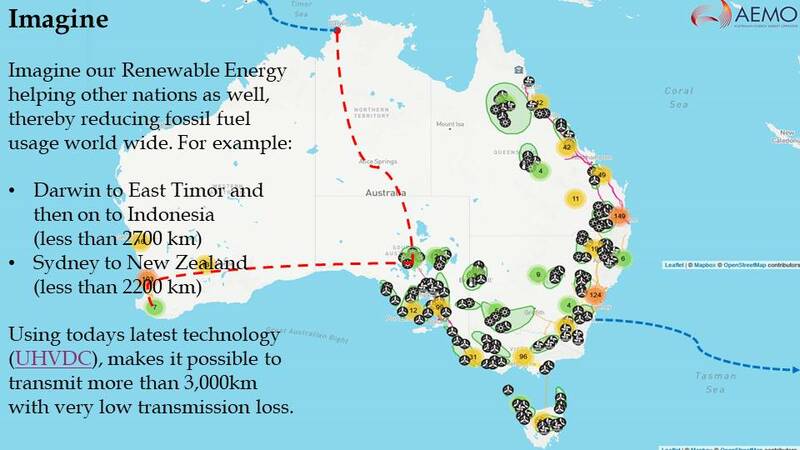 This is a CSR (Corporate Social Responsibility), project where IRECs (like solar energy generators), are installed in 10,000 villages (in Africa, India, East Timor, Haiti or Australia), and financed by 10,000 sponsoring Australian Corporations. One Corporate sponsoring One village at a time. 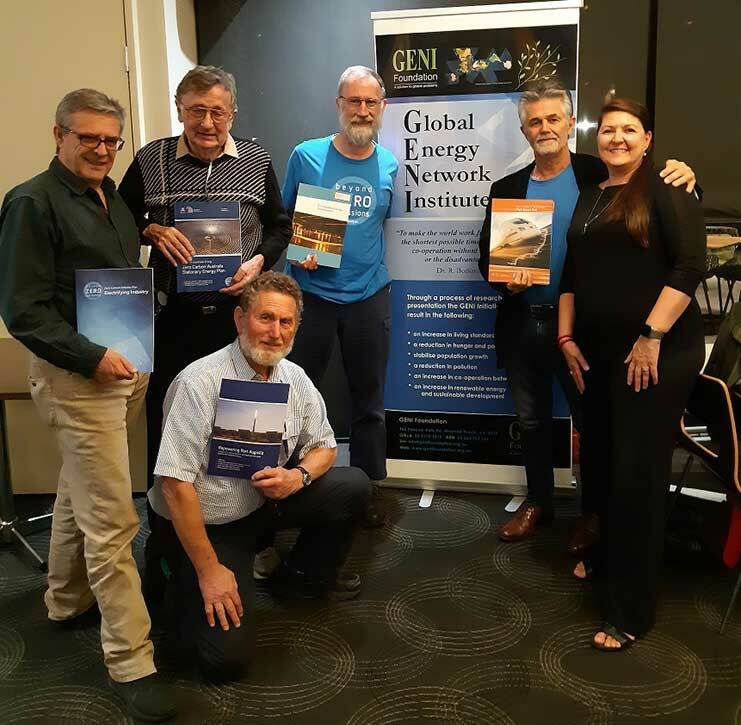 We also want to encourage the building of small renewable energy centres in remote communities within Australia that are not currently connected to the national grid. This will eventually make it easy for the national grid to be extended because the distances between the new IRECs will progressively get shorter and shorter each time a new one is added. 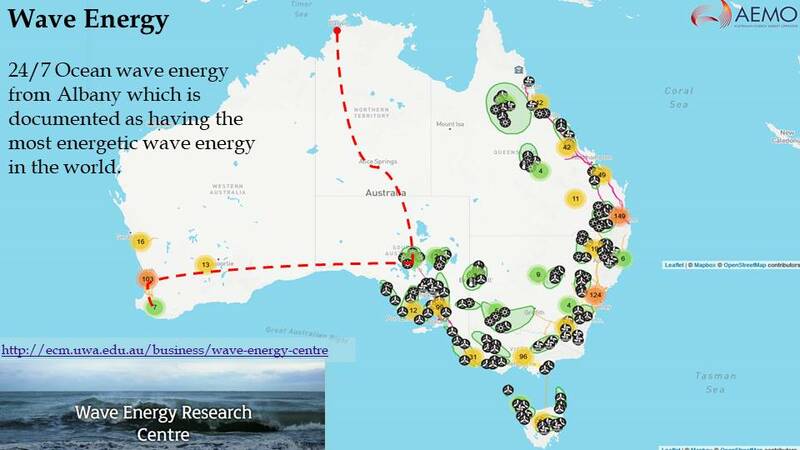 As the network infrastructure is extended, these remote communities will generate their own revenue by supplying the national grid with renewable energy. 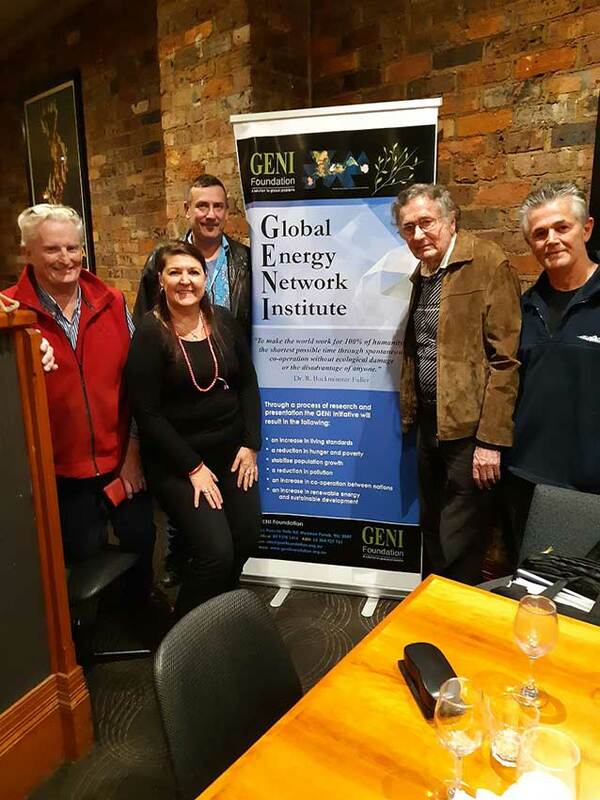 The Australian Energy Market Operator(AEMO), has produced some fantastic information which GENI has utilised for this initiative and it starts with the representation of the Australian National Grid as at 2016. HVDC transmission losses are quoted as less than 3% per 1,000 km, which are 30 to 40% less than with AC lines, at the same voltage levels. 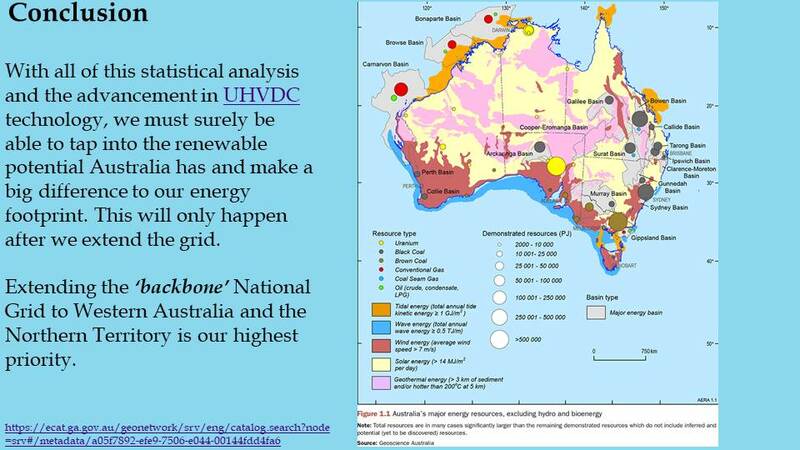 For UHVDC the losses are even less. Western Australia has the best 24/7 natural resource potential in the world (Ocean currents), and we should make an investment in it for the benifit of all Australians. 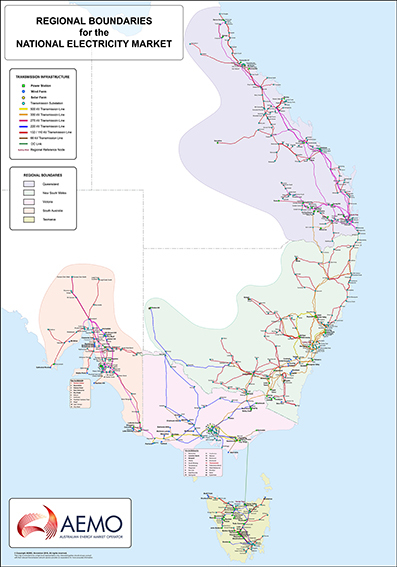 We should also go from South Australia to Darwin (Northern Territory). 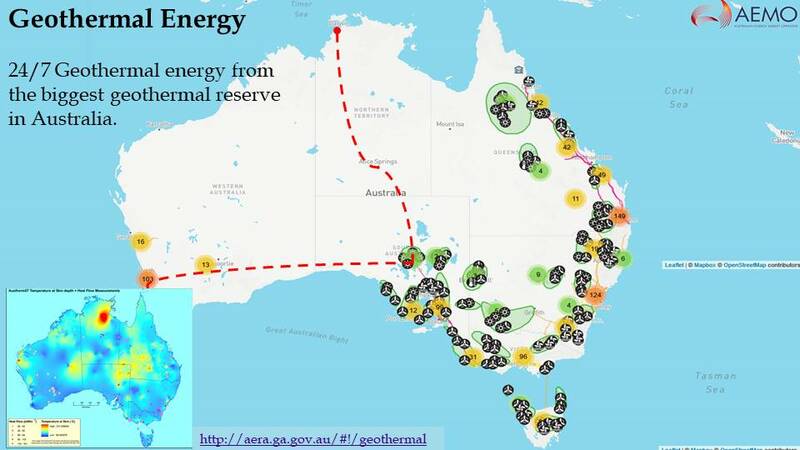 That would give the National Grid access to the greatest GEO Thermal region in all of Australia. Imagine being able to export our renewable energy to our neighbours in times of abundance. To continue the medical analogy, the National Grid is our energy BACKBONE and needs manipulation for it to remain healthy. Extending it to meet our needs and obligations is the highest priority.